As companies expand, they have more and more projects in progress at the same time. This trend has led to the rise of the multi-project management role. Efficient orchestration of simultaneous projects empowers rapid company growth. Today, most companies are already involved in multi-project management — but they’re still looking for the best tools to cope with the complexity of such environments. And interestingly, many people still find it difficult to differentiate between multi-project management and project portfolio management. The most basic definition of multi-project management (MPM) is managing an environment in which people are working on multiple projects simultaneously. In such an environment, management has to deal with parallel projects with different deadlines and sizes but with a shared resource pool. 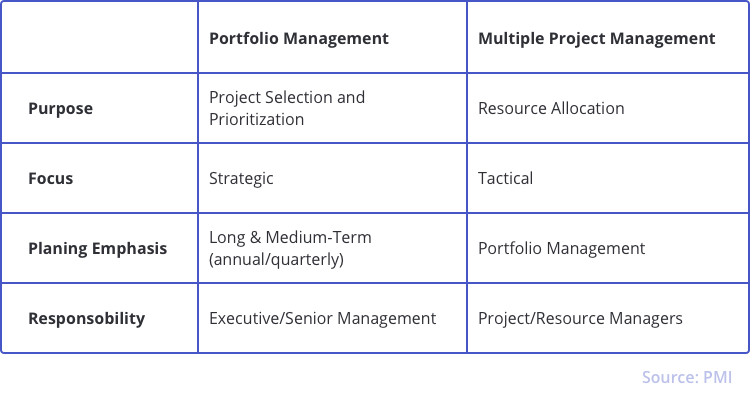 The very concept of multi-project management is quite recent, which is why there aren’t enough strategies, techniques, and tools to deal with it efficiently. Many project managers complain about the shared resource pool, which often results in shuffling the people that work on their projects and substituting trained people with inexperienced. At all companies, there’s a set of golden rules: get things done as fast as possible, reach project goals, and look for ways to cut costs. In order to follow these rules in a multi-project environment, project managers have to recognize the importance of task prioritization. Masterful task prioritization and resource allocation is an integral part of planning multiple projects. That’s why you need to embrace prioritization when working on multiple projects simultaneously, know how to switch between teams, and be up to date on every project you’re leading. Whether you’re a C-level executive doing project portfolio management or a project manager focusing on managing multiple projects, you need to know how to optimize your employees’ work and increase your project output. Web-based management tools are handy when it comes to multi-project management. The best way to keep track of parallel projects is to use a central database that helps you control them all in real time with a single tool. Our researchers have been studying multi-project environments for more than 15 years. They recommend you focus on urgent and critical constraints when juggling several projects at the same time. According to their experience, the main reasons for project bottlenecks are resource overload and wrong priorities. Here’s a recording of a webinar our researcher Jan Willem Tromp gave to PMI on how to manage a multi-project environment. In this webinar, Tromp shows how resources should be managed in order to make multi-project environments successful. For many project leaders, ease of use, reliability, and ease of integration are the decisive features when it comes to choosing multi-project management software. Epicflow offers all these things. Want the ability to manage and effectively deliver multiple projects? Provide your contact information in the form below to request an Epicflow demonstration. Our PM consultants will contact you to arrange a meeting and show you how to maximize your results with Epicflow.